Pantaeva, an Eskimo raised in Siberia who quickly shot from being a little girl with big dreams to a young woman with an international modeling career, spins a fantastic biographical saga out of an impressive store of encounters. From serving tea to the Dalai Lama in Russia to flopping down the streets of Manhattan in a pair of sneakers borrowed from fashion photographer Irving Penn, Pantaeva has made an adventure-filled trip to superstardom. Spurred through an arduous early life in a poor Siberian city by a strong sense of her own potential, a supportive family, and an uncanny ability to be in the right place at the right time, Pantaeva colorfully sketches a mystical account of her journey to success. The story is intriguing partly because she deals with the themes that shaped her identity—her Buryat Eskimo heritage, her belief in the power of fate—instead of bragging about the glamour of the camera or complaining about the hardships of her formative years. There are, however, two faults that detract from the overall presentation. First, events are often jumbled and disjointedly strung together, making it difficult for readers to discern the exact location or the date of an episode. Second, Pantaeva frequently substitutes understanding gained through hindsight for her original unfiltered experiences; for example, when she describes her early childhood, she expresses a deeper understanding of events than it’s believable that a three-year-old could have. But once Pantaeva’s ability to express herself catches up with her predilection for finding tremendous importance in the smallest gestures, this discontinuity disappears. Pantaeva’s vignettes possess an appealingly improvisational quality that conveys how tenuously connected episodes can eventually congeal into a recognizable theme. 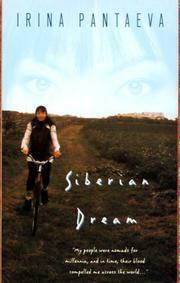 Though technically an autobiography, Siberian Dream reads more like an intriguing fairy tale.